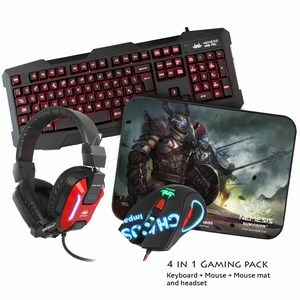 The nemesis Kane edition chaos pack comes with everything you need to get your gaming setup ready! A angular and stylish gaming headset that provides clear audio feedback for immersive gaming experience. Has blue LED lights on side to complement the stylish red headset. A simple and angular designed backlit LED gaming keyboard with three LED colour lights including blue,purple and red! Contains up to four different brightness levels and uses braided cables to prevent tangling. A stylish gaming mouse with backlit LED lights and has up to four different DPI setttings: 400,800, 1600 and 2400.